The Provost Student Advisory Committee had its first meeting last week. 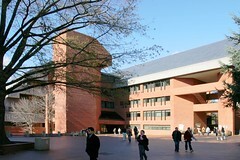 The committee contains both undergraduate and graduate students, with representation from all the schools connected to the main campus. It was an initial chance to meet each other and think about agenda items. We went around the room introducing ourselves and giving the reasons that lay behind our willingness to give our time to the committee. Some students were driven by a passion on a particular issue; some wanted to give back to Georgetown; some wanted to influence the future course of the university in ways they imagined such a committee might facilitate. The very focused interests included wanting to increase the influence of Jesuit values in the day-to-day activities of the university, the support for students returning to school from military service, the support of events enhancing the intellectual environment among students. We plan to tackle all those. The graduate student members of the committee were especially interested in talking about career support for their job search options, about space issues affecting graduate students in their teaching assistant roles, and about graduate stipends and financial support. Many of the students were troubled by the difficulty of taking courses from multiple schools on campus, of being treated as an outsider when considering courses in other programs, and of the administrative burdens to assemble a nontraditional curriculum. One of the students, living in the Georgetown neighborhood, wanted to talk about what students might do themselves to improve relationships with our proximate neighbors. Over time, I want to use the group for input into options facing the university on key decisions. Ideally, I’d have some way to learn the diversity of opinions among students on important issues. We’ll try in the group to air those diverse sentiments and not drive for consensus. Our next meeting is coming up and we’ll cover three topics: a) how students can play a role in improving relationships with the proximate neighborhood, b) how alternative options for supporting graduate programs and the future of the Graduate School are viewed, and c) how to reduce the impediments for students to do coursework in multiple programs. It’s already clear to me that it will be a fun group to work with and that they have a deep commitment to making Georgetown better. I don’t see how we lose with that combo. If you have comments to get into the committee’s discussion on the three issues above, please forward comments to this blog post. Any chance of a public release of the meeting’s minutes? Or at least the names of those on the advisory committee? Great to know that the committee meeting was successful! I hope you guys work on the cross-college curriculum problem. It does not make much sense for someone in the SFS to not be allowed to minor in something. If our schedules permit it, there should be options available to allow us to do this, especially after consulting with our dean.